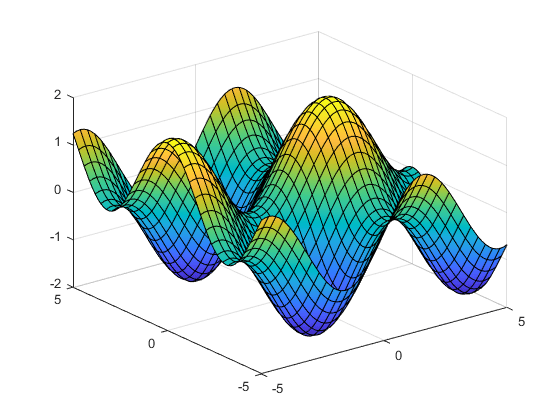 fsurf(f) creates a surface plot of the symbolic expression f(x,y) over the default interval [-5 5] for x and y.
fsurf(f,[min max]) plots f(x,y) over the interval [min max] for x and y.
fsurf(f,[xmin xmax ymin ymax]) plots f(x,y) over the interval [xmin xmax] for x and [ymin ymax] for y. The fsurf function uses symvar to order the variables and assign intervals. 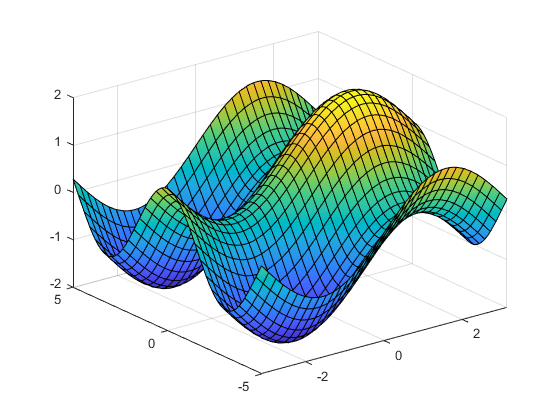 fsurf(funx,funy,funz) plots the parametric surface x = x(u,v), y = y(u,v), z = z(u,v) over the interval [-5 5] for u and v.
fsurf(funx,funy,funz,[uvmin uvmax]) plots the parametric surface x = x(u,v), y = y(u,v), z = z(u,v) over the interval [uvmin uvmax] for u and v.
fsurf(funx,funy,funz,[umin umax vmin vmax]) plots the parametric surface x = x(u,v), y = y(u,v), z = z(u,v) over the interval [umin umax] for u and [vmin vmax] for v. The fsurf function uses symvar to order the parametric variables and assign intervals. fsurf(___,LineSpec) uses LineSpec to set the line style, marker symbol, and face color. Use this option after any of the previous input argument combinations. fsurf(___,Name,Value) specifies line properties using one or more Name,Value pair arguments. Use this option after any of the input argument combinations in the previous syntaxes. 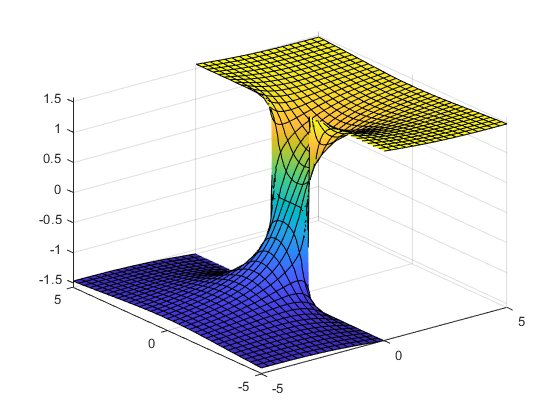 fsurf(ax,___) plots into the axes with the object ax instead of the current axes object gca. fs = fsurf(___) returns a function surface object or parameterized function surface object, depending on the type of surface. Use the object to query and modify properties of a specific surface. 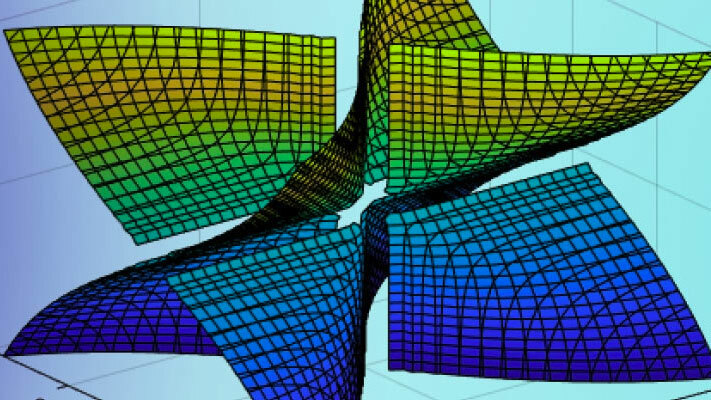 For details, see FunctionSurface Properties and ParameterizedFunctionSurface Properties. Plot the input sin(x)+cos(y) over the default range -5<x<5 and -5<y<5. Plot the real part of tan-1(x+iy) over the default range -5<x<5 and -5<y<5. Plot sin(x)+cos(y) over -π<x<π and -5<y<5 by specifying the plotting interval as the second argument of fsurf. Improve the plot's appearance by using camlight. for 0<u<2π and 0<v<2π . 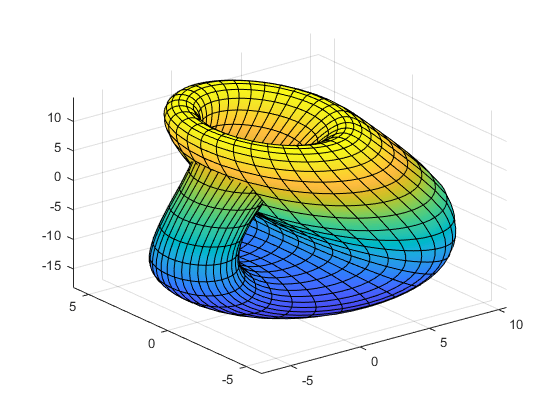 Show that the Klein bottle has only a one-sided surface. 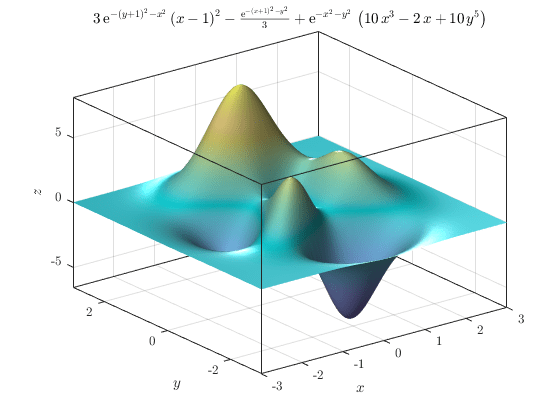 For x and y from -2π to 2π, plot the 3-D surface ysin(x)-xcos(y). Add a title and axis labels. Create the x-axis ticks by spanning the x-axis limits at intervals of pi/2. Convert the axis limits to precise multiples of pi/2 by using round and get the symbolic tick values in S. Display these ticks by using the XTick property. Create x-axis labels by using arrayfun to apply texlabel to S. Display these labels by using the XTickLabel property. Repeat these steps for the y-axis. 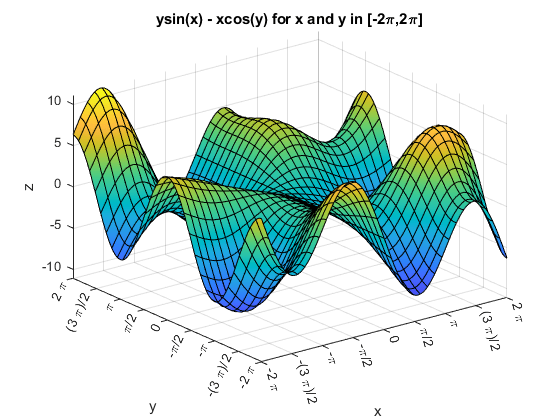 Plot the parametric surface x=ssin(t), y=-scos(t), z=t with different line styles for different values of t. For -5<t<-2, use a dashed line with green dot markers. For -2<t<2, use a LineWidth of 1 and a green face color. For 2<t<5, turn off the lines by setting EdgeColor to none. Specify an output to make fcontour return the plot object. Change the range of u to [-30 30] by using the URange property of fs. Set the line color to blue by using the EdgeColor property and specify white, dot markers by using the Marker and MarkerEdgeColor properties. 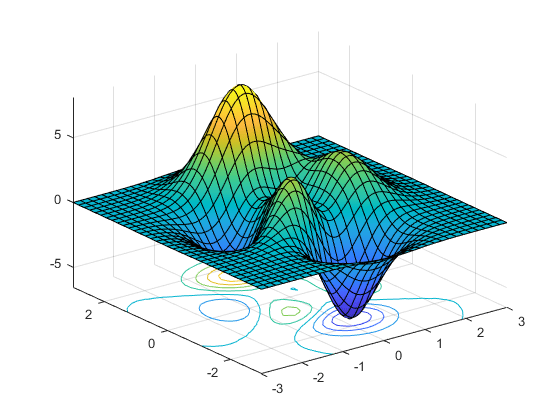 Plot multiple surfaces using vector input to fsurf. Alternatively, use hold on to plot successively on the same figure. When displaying multiple surfaces on the same figure, transparency is useful. 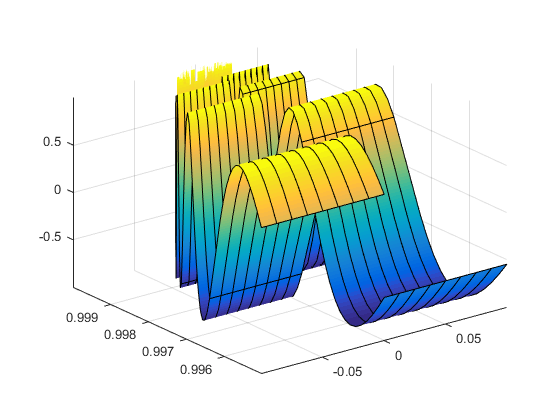 Adjust the transparency of surface plots by using the FaceAlpha property. FaceAlpha varies from 0 to 1, where 0 is full transparency and 1 is no transparency. 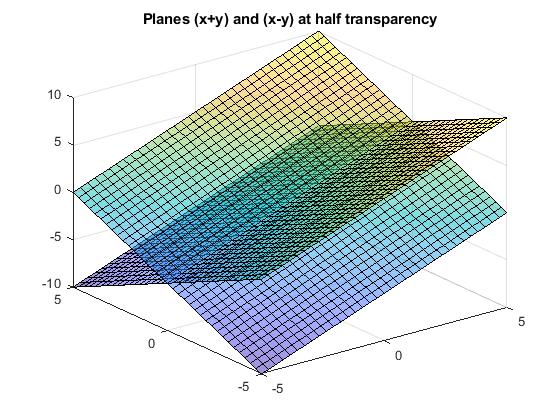 Plot the planes x+y and x-y using vector input to fsurf. Show both planes by making them half transparent using FaceAlpha. Control the resolution of a surface plot using the 'MeshDensity' option. Increasing 'MeshDensity' can make smoother, more accurate plots while decreasing it can increase plotting speed. Divide a figure into two using subplot. 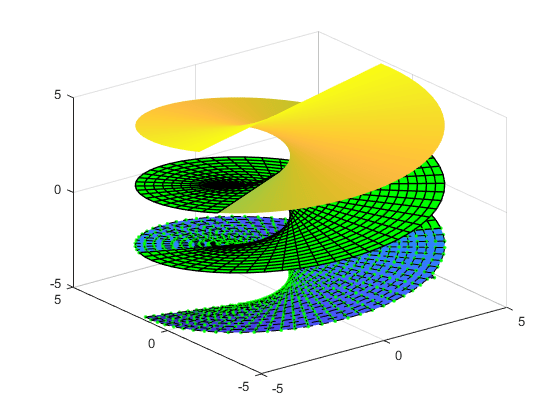 In the first subplot, plot the parametric surface x=sin(s), y=cos(s), and z=(t/10)sin(1/s). The surface has a large gap. Fix this issue by increasing the 'MeshDensity' to 40 in the second subplot. fsurf fills the gap showing that by increasing 'MeshDensity' you increased the plot's resolution. Show contours for the surface plot of the expression f by setting the 'ShowContours' option to 'on'. Create animations by changing the displayed expression using the Function, XFunction, YFunction, and ZFunction properties and then by using drawnow to update the plot. To export to GIF, see imwrite. for -0.1 < u < 0.1 and 0 < v < 1. 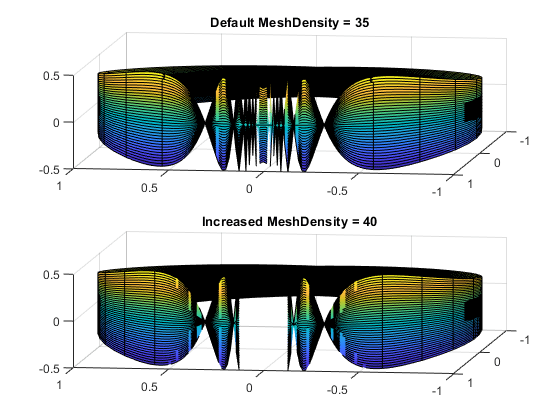 Increase plotting speed by reducing MeshDensity to 9. 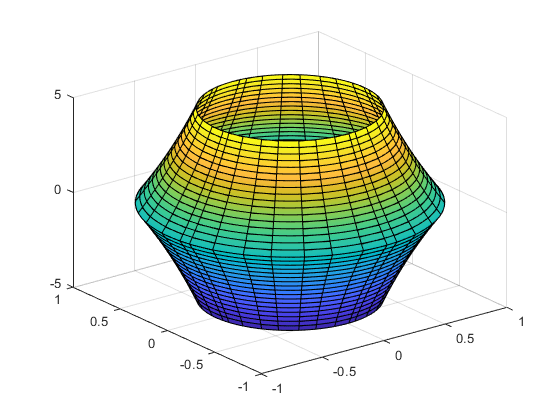 Plot the expression f as a surface. Improve the appearance of the surface plot by using the properties of the handle returned by fsurf, the lighting properties, and the colormap. Create a light by using camlight. Increase brightness by using brighten. Remove the lines by setting EdgeColor to 'none'. Increase the ambient light using AmbientStrength. For details, see Lighting, Transparency, and Shading (MATLAB). Turn the axes box on. For the title, convert f to LaTeX using latex. Finally, to improve the appearance of the axes ticks, axes labels, and title, set 'Interpreter' to 'latex'. Expression or function to be plotted, specified as a symbolic expression or function. Plotting interval for x- and y-axes, specified as a vector of two numbers. The default is [-5 5]. Plotting interval for x- and y-axes, specified as a vector of four numbers. The default is [-5 5 -5 5]. Parametric functions of u and v, specified as a symbolic expression or function. Plotting interval for u and v axes, specified as a vector of two numbers. The default is [-5 5]. Plotting interval for u and v, specified as a vector of four numbers. The default is [-5 5 -5 5]. Axes object. If you do not specify an axes object, then fsurf uses the current axes. Line style, marker symbol, and color, specified as a character vector. The elements of the character vector can appear in any order, and you can omit one or more options from the character vector specifier. The properties listed here are only a subset. For a complete list, see FunctionSurface Properties. Number of evaluation points per direction, specified as a number. The default is 35. Because fsurf objects use adaptive evaluation, the actual number of evaluation points is greater. 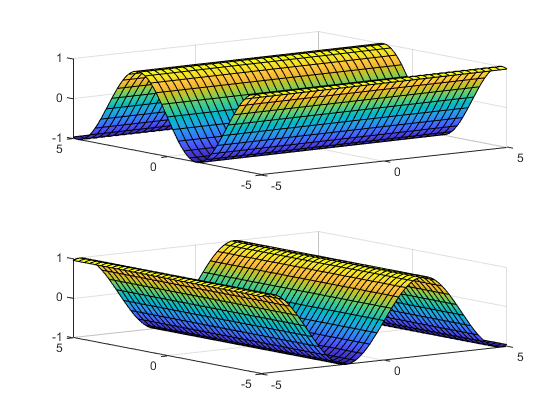 Display contour plot under plot, specified as 'off' (default) or 'on'. Line color, specified as 'interp', an RGB triplet, a hexadecimal color code, a color name, or a short name. The default RGB triplet value of [0 0 0] corresponds to black. The 'interp' value colors the edges based on the ZData values. Marker outline color, specified as 'auto', an RGB triplet, a hexadecimal color code, a color name, or a short name. The default value of 'auto' uses the same color as the EdgeColor property. One or more objects, returned as a scalar or a vector. 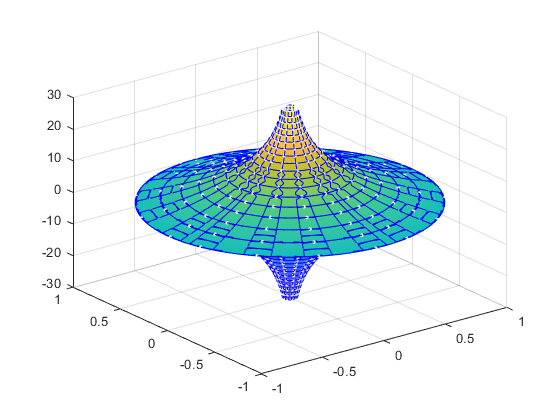 The object is either a function surface object or parameterized surface object, depending on the type of plot. You can use these objects to query and modify properties of a specific line. 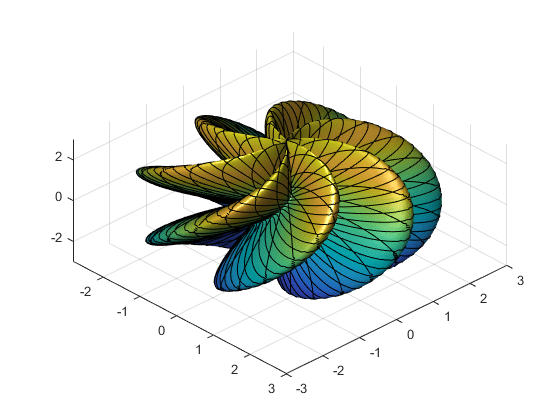 For details, see FunctionSurface Properties and ParameterizedFunctionSurface Properties. fsurf assigns the symbolic variables in f to the x axis, then the y axis, and symvar determines the order of the variables to be assigned. Therefore, variable and axis names might not correspond. To force fsurf to assign x or y to its corresponding axis, create the symbolic function to plot, then pass the symbolic function to fsurf. For example, the following code plots f(x,y) = sin(y) in two ways. The first way forces the waves to oscillate with respect to the y axis. The second way assigns y to the x axis because it is the first (and only) variable in the symbolic function.